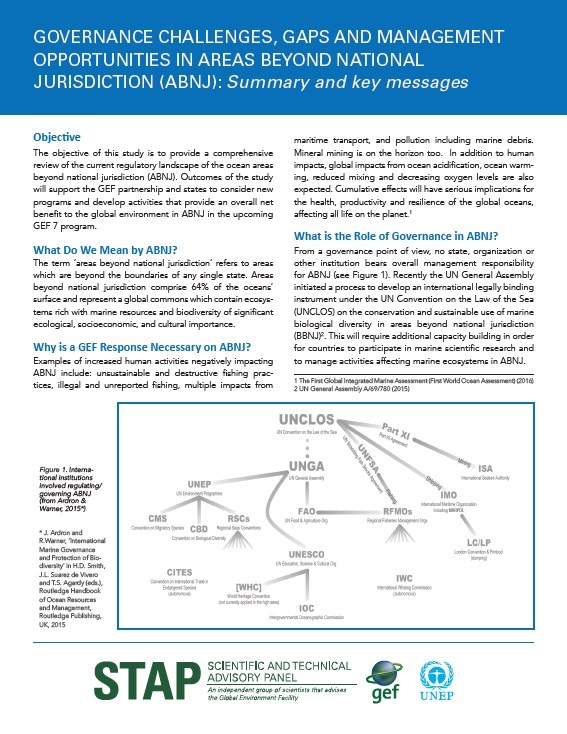 The objective of this study is to provide a comprehensive review of the current regulatory landscape of the ocean areas beyond national jurisdiction (ABNJ). Outcomes of the study will support the GEF partnership and states to consider new programs and develop activities that provide an overall net benefit to the global environment in ABNJ in the upcoming GEF 7 program. The term ‘areas beyond national jurisdiction’ refers to areas which are beyond the boundaries of any single state. Areas beyond national jurisdiction comprise 64% of the oceans’ surface and represent a global commons which contain ecosystems rich with marine resources and biodiversity of significant ecological, socioeconomic, and cultural importance.